Award-winning author Melina Marchetta reopens the story of the group of friends from her acclaimed novel Saving Francesca - but five years have passed, and not it's Thomas Mackee who needs saving. After his favorite uncle was blown to bits on his way to work in a foreign city, Tom watched his family implode. He quit school and turned his back on his music and everyone that mattered, including the girl he can't forget. Shooting for oblivion, he's hit rock bottom forced to live with his single, pregnant aunt, work at the Union pub with his former friend, and reckon with his grieving, alcoholic father. Tom's in no shape to mend what's broken. But what if no one else can either? 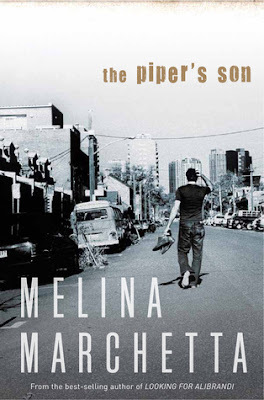 An unflinching look at family, forgiveness, and the fierce inner workings of love and friendship, The Piper's Son redefines what it means to go home again. The Piper's Son is a companion novel to Saving Francesca, a book that I absolutely adored. My favorite thing about companion novels is that, unlike with most series, you're able to spend more time with characters you've loved while reading from the perspective of a different character. The Piper's Son absolutely represents the very best kind of companion novel. Set five years after Saving Francesca, the book has a third-person narrative that alternates between two points of view. The first is Tom Mackee, the main character and one of Francesca's friends from St. Sebastian's. The second point-of-view is his aunt Georgie, a new character that you don't meet in Saving Francesca. Tom is the primary focus of the book, but the chapters from Georgie's perspective make the book even more layered and complex. Both Georgie and Tom, really the entire Mackee family, have experienced some devastating losses. Grief, brutally raw and honest, is all over every word in this book. Saving Francesca is a book where depression is central to the story, but this book packs even more of an emotional punch. And yet, it still manages to be hopeful. This is just one more reason Melina Marchetta has become one of my few auto-buy authors. I don't read many books from a male perspective, but I hate if an author writes from the point-of-view of the opposite gender and it rings false. You know what I mean? Like when a woman writes about a teen boy and you're thinking, "I can't imagine that very many, if any, teen boys really think that way." Well, I'm happy to say that this thought never once crossed my mind while reading The Piper's Son. I don't know what it's like inside a boy's mind, but Tom seemed completely believable and authentic. When we first meet him, Tom is difficult, frustrating and not very likeable. His grief has made him bitter, retreat into himself and push everyone away. It was painful to read about him, but you also just can't stop. Even when you don't like him, you're still rooting for him to find his way in the world. Melina Marchetta sure knows how to write some heartbreaking scenes and characters. The entire Mackee family is fractured in the wake of the tragedy they've endured, and you can feel the familial tension almost leaping off the page. I absolutely love how important family is in Marchetta's books! The only downside to Tom's rather large family, and its complex history, is that I was confused about who certain people were at times. I think listening to this as an audio probably contributed a little bit to that confusion as well. After adoring Saving Francesca as an audiobook, I knew that I wanted to try The Piper's Son in audio, too. Read by Michael Finney, I thought the audio was a wonderful way to experience this book. Listening to it really helped me connect with Tom and his perspective. However, I did reference my ebook a few times for more clarification on a few details or characters that I felt like I'd missed while listening. For future readers, I'd probably recommend starting with the book and then rereading with the audio or doing the audio and book simultaneously, unless you're an experienced audiobook listener. The reason for that is the fact that there are multiple story lines going on in this book: Tom and his family in the wake of the loss of one of their family members, Tom's attempts to reconnect with his St. Sebastian's friends, his relationship with a certain someone, and Georgie's pregnancy and relationship with the baby's father, her ex-boyfriend. Marchetta is a masterful storyteller, and she weaves the different plots together into a unified and cohesive novel that I loved. However, it was definitely a lot to keep track of while listening! I recently watched an interview with Marchetta on YouTube and she talked about how community and identity are the two themes that she thinks are at the heart of every story she writes. She also discussed how each book she's written has allowed her to write the subsequent book - how she may never have been able to write each particular story if she hadn't written the one before it. I absolutely loved hearing that because you can absolutely see community and identity throughout this book. It ties everything to together, and it's what makes you fall in love with these characters and this story. You can see how The Piper's Son has built on what she's written in her previous books, and I really love that about her as an author. The Piper's Son felt more adult than anything I've read by Marchetta before, and it's also a very heavy read. There are moments of laughter and levity, but it's definitely a book that makes you feel a little raw inside. All that to say, I loved it! This is everything you could want and more in a companion novel. It stands on its own two feet, but it also just enhances and enriches the world and characters Marchetta has already created if you start by reading Saving Francesca. Meet Francesca, give your heart a rest, and then come meet Tom. He is someone you won't soon forget! "Maybe she'd always been there. Maybe strangers enter your heart first and then you spent the rest of your life searching for them." "I’m scared I’m going to spend the rest of my life in a state of yearning, regardless of where I am." Yes, you definitely need to get to it! I absolutely loved Saving Francesca, and I think Melina did such a great job at extending the story in The Piper's Son. And I loved how they're so different but complement each other really well. Glad you enjoyed the review! Oh my gosh again! I seriously didn't realize that this book was a companion to Saving Francesca! So thanks for that information! And once again, I like that you have included the audiobook information here. I like that you mention that it was a little more complex so you referenced the actual book, because that is helpful to me. I might use that to actually go straight to the print/ecopy. ALSO YES to audio and print simultaneously forever and ever, amen, that is all. Speaking of the complexity and multiple storylines, that reminds me of the wonderful Jellicoe Road, because remember how it was a little bit confusing to begin with until you find your bearings and figure out who everyone is?? You're destroying my to-read plans, Hannah. But that's okay! I actually like the sound of this one better than Saving Francesca because I tend to like the male protagonists more (they're so much harder to find, particularly when they're well done) but I will respect the whole companion thing and go in order. This is great! I'm not sure I've ever read any thoughts on this book before. Haha I think you will really like this, Asheley! And I was totally thinking of you when I included the audiobook information because I know that tells you (and other audio lovers like you) a lot about the book. I like to give all that knowledge out ahead of time so people have the best reading/listening experience possible! And yes, it was definitely similar to Jellicoe Road. Thankfully, it wasn't as confusing since it didn't have that sort of "puzzle" feeling, but it definitely took a bit of time to sort everyone out (which is how I felt in Jellicoe too). MUWAHAHAHA! Love destroying your to-read plans :) I love that you prefer male protagonists - I don't think I've read a ton of books (at least lately) with them. But I definitely think you'll enjoy Tom, despite or maybe because of his flaws. I actually asked a few people if it was necessary for me to read Saving Francesca (my library didn't have it, only The Piper's Son) and they all agreed that I needed to. Now that I've read both, I would agree. It's not like you wouldn't still enjoy The Piper's Son without having read Saving Francesca, but the relationships in The Piper's Son have so much more depth if you know more of the history of them. Can't wait for you to read thisssss! I really, really want to read this book! There's just something wonderful about Melina's writing, something that I truly enjoy, and I think that I need to delve back into her more contemporary work (even though I'm also loving Finnikin of the Rock!). Yes, I love Melina's contemporary novels. I only have Looking for Alibrandi left that I haven't read, and I'm basically saving it for the right moment. I get so sad thinking about how once I read it there's no more new Melina contemporary left for me to read!